During the end of August and beginning of September 2007, the first season of excavation was conducted at the Neolithic site of Beisamoun (License No. G-80/2007; map ref. NIG 254035–88/776828–7155; OIG 204035–88/276828–7155). The excavation, on behalf of the Antiquities Authority and the Centre National de la Recherche Scientifique (CNRS), was directed by H. Khalaily and F. Bocquentin, with the assistance of N. Samuelian (field supervision; Paris I) and G. Le Dosseur (bone tools; CNRS), Y. Ya‘aqobi (logistic administration), O. Barzilai (flint) and L.K. Horwitz (fauna). The site of Beisamoun is located in the western margins of the Hula Basin, c. 10 km south of Qiryat Shemona. A moderate Mediterranean climate and water resources in the immediate vicinity of the site, such as the ‘Enan and Agamon springs, were one of the major factors for establishing prehistoric settlements in this region, one of which was ‘Ein Mallaha, a major Natufian site in the Levant. The rich ecosystem of this region has played an important role in the prehistoric occupation of the central Levant and offered people the possibility of long-term occupation in a single area. As part of the central Jordan Valley, it served as a conduit for east–west and north–south migration/exchange of populations and/or materials. Consequently, the Hula Basin is particularly suitable for exploring environmental exploitation systems, as well as cultural and biological transmission between groups inhabiting the same region. 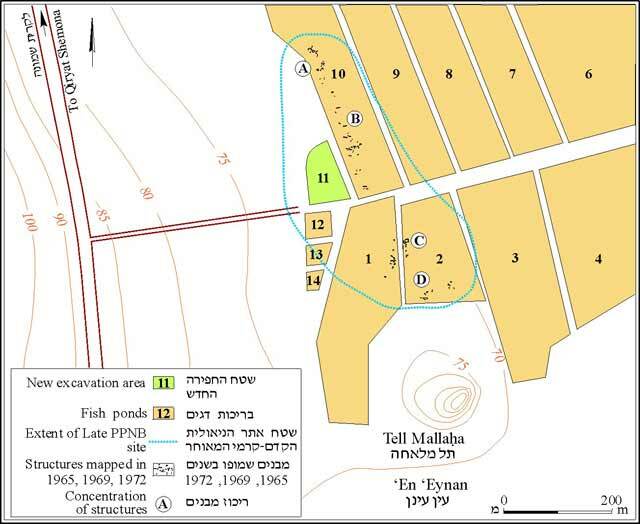 The Neolithic site of Beisamoun was extensively investigated since the early 1950s, when fish-breeding ponds were dug into the underlying Neolithic settlement and partly destroyed the archaeological layers. The subsequent drainage of these ponds enabled A. Assaf (Curator of the Mayan Baruch Museum of Prehistory of the Hula Basin) to collect a large PPNB assemblage and demarcate the extent of the site (c. 100 dunams). In 1969, a French team, supervised by M. Lechevallier (CNRS), began mapping the structures discernible at the bottom of the different fish ponds, which was followed by a 70 sq m salvage excavation in 1972 (Lechevallier M. 1978, Abu Gosh et Beisamoun, deux gisements du VIIème millenaire avant l'ere Chretiénne en Israël. Mémoirs et Travaux du Centre de Recherches Préhistoriques Français du Jérusalem 2. Association Paléorient, Paris). The excavation exposed a rectangular structure with a well-preserved plaster floor, associated with several graves, numerous artifacts and, among other distinct findings, two plastered skulls for which no radiometric dating was undertaken. The major occupation phase at Beisamoun is dated to the Pre-Pottery Neolithic B but Pottery Neolithic and Bronze Age deposits are also present, as attested by archaeological finds and recent rescue excavations (Permit No. A-5107). The new project at the site was initiated to test a large area at the northwestern part of the site, where the modern fish pond No. 11 is located (Fig. 1). A surface of 3000 sq m was mechanically cleaned. Within this area, one sector of 76 sq m was excavated (Sector E; Fig.2) and three long trenches (1, 2 and 3) were opened beyond the excavation area proper. Level 0 (thickness 10–30 cm) comprised dark brown loose sediment very rich in archaeological finds. This level was shallow in the southwestern part of the sector and deepened toward the northeastern side. Level I (thickness 5–20 cm) consisted of brown grayish sediment, rich in finds, which contained the upper-most stone structures. Level Ia (thickness 10–30 cm) contained fine-grained brown grayish sediment, relatively poor in finds, which yielded several architectural elements, such as segments of walls and a patch of compact earth floor. Level Ib was uncovered in some areas toward the end of the excavation season. This fine-grained sediment, similar to the one in Layer Ia, was very compact and rich in charcoal and ochre specks. It seems that this level was spread out over all of the excavation area. Several architectural features were recovered in sector E (Fig. 3); three were attributed to Level I. The first is a stone wall (W200; exposed length 5.3 m), oriented northwest–southeast. It was constructed from two parallel rows of stones and preserved 20 cm high. This wall seems to be part of a large structure that was partially exposed this season. The second feature, adjacent to W200, is an oval structure (L201), built of two–three rows of stones. The third (L206) is an oval pit that had cut through level Ia, destroying part of Floor 208. 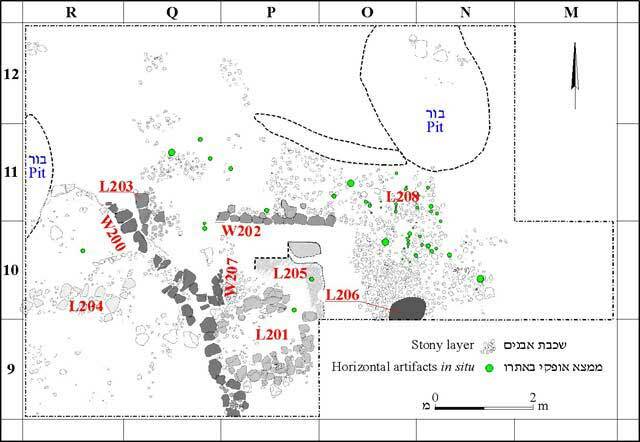 Five elements were, so far, exposed from the earlier occupation level (Ia), three were segments of walls. Wall 202 (preserved length 2.4 m), was constructed from stones and mud bricks. Wall 207 was perpendicular to W202. The surface between these walls was a hard calcified white material platform (thickness 20 cm) that could be the remains of a poorly preserved plaster floor (L205). Another feature was a well-defined stony area (L208) that contained numerous flint and bone items. It could have been a living floor associated with one of the structures that was partially exposed. 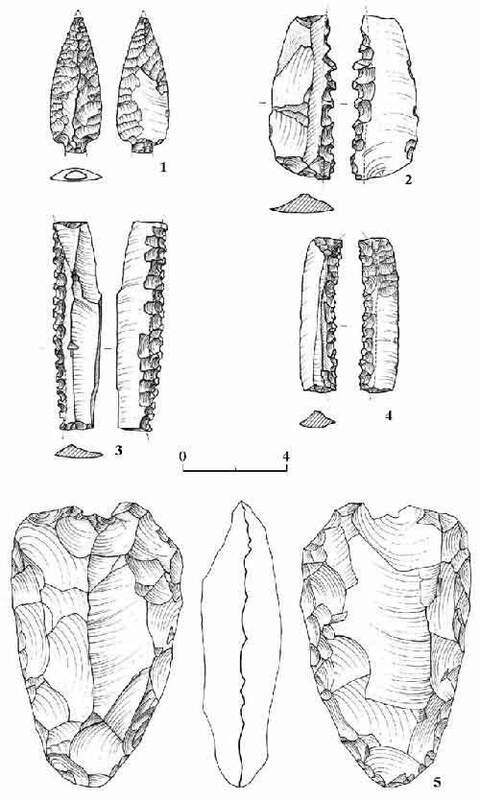 The remarkable material culture included a rich flint assemblage, dominated by sickle blades, arrowheads and other Naviform products (Fig. 4). The majority of the faunal remains consisted of what has tentatively been identified as wild species, namely Bos cf. primigenius, Sus scrofa fer and Gazella gazella. The caprine (Ovis/Capra) remains, in contrast, comprised a minority of the identified finds. The results of the first season of the renewed excavations at Beisamoun demonstrate that this part of the site is undisturbed and the archaeological remains are well preserved. The finds recovered from two trenches, which were dug in several localities, indicate that the archaeological remains in this area of the site are preserved at least 1.2 m deep. 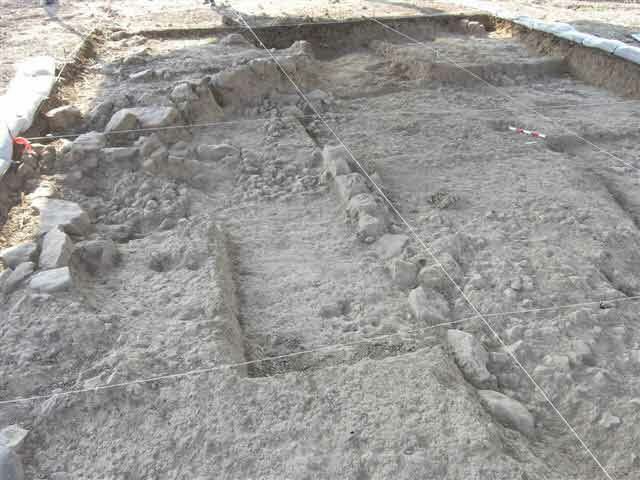 Hence, it is reasonable to assume that the current excavation area is the best and most promising part of the site, providing an excellent opportunity to explore the major PPNB occupation in Beisamoun. 2. Sector E, general view, looking west.